l-r; Architect Gary Everton, Mayor David Briley greeting Lonnell Mathews and Judge Nick Leonardo. In the foreground HUD official Sermona Mitchell; in the background, District 1 Councilman Jonathan Hall. NASHIVLLE, TN — It took longer to decide what to build than it will take to construct 40 new apartments in Bordeaux. Metro gave land to the Metropolitan Development Housing Agency (MDHA) next to the old Knowles Assisted Living Center. MDHA used $4 million in federal disaster relief funds to finance the project. It will take about 15 months to complete construction on two and three-bedroom units for families making up to 120 percent of $60,000/year, the city’s average mean income (AMI). In layman’s terms, the units are being built for people who have good jobs but still can’t afford to buy a house in Nashville where the average home sales price has risen to $255,000. 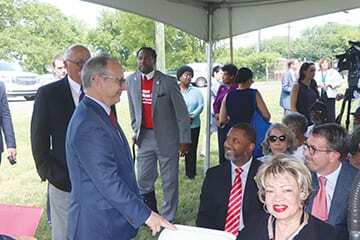 “It will be a place where teachers, firefighters, and police can attain a great place to live in a neighborhood that is about to see incredible progress,” said Mayor David Briley at a groundbreaking ceremony. 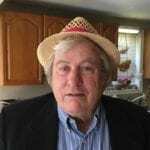 MDHA Executive Director Jim Harbison said there were some disagreements at first but after more than 50 meetings he was really excited about the project. He thanked the city council and the Mayor’s office for approving the Bordeaux Redevelopment District and bringing on line the first housing project Bordeaux residents have welcomed in recent years. “We hope this starts others to come behind us and invest in this beautiful site,” Harbison said. He thanked First Advantage Bank in Clarksville for lending MDHA additional money to build the project. The project will be three stories high with eighteen 2-bedroom units and twenty-two 3-bedroom units. “Bordeaux is really going to be shining star in the future of this city and I look forward to working to make sure that is really the case,” Briley said. He said bringing more assets to Bordeaux in the future “are really going to be incredible and transformative” for the district. Briley thanked members of the MDHA board and Sernorma Mitchell of the federal Housing and Urban Development agency (HUD). Joining Briley in a ground-breaking ceremony were former councilman Nick Leonardo, Lonnell Mathews, the new Juvenile Court Clerk, At Large Councilman John Cooper, Rep. Brenda Gilmore, Architect Gary Everton, and Ruby Baker, President of the Bordeaux Hills Residential Association. “This is a momentous occasion,” said Baker surrounded by a dozen people from the neighborhood. “This has just changed the trajectory for this district. We are moving forward,” she said.